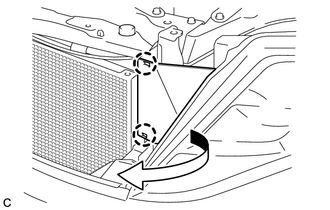 (a) Disengage the 2 claws to separate the radiator side deflector LH as shown in the illustration. (b) Check that the ignition switch is off. (c) Check that the cable is disconnected from the negative (-) battery terminal. (d) Disconnect the connector from the front airbag sensor. (2) Push down the white housing lock again and disconnect the connector. Do not push down part (A) shown in the illustration when disconnecting. 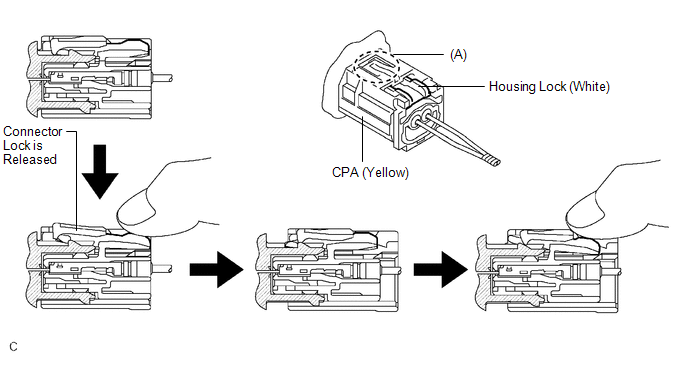 (3) After disconnecting the connector, check that the position of the white housing lock is correct as shown in the illustration. (e) Remove the bolt and front airbag sensor from the body. 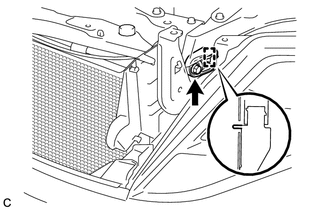 Loosen the bolt while holding the front airbag sensor because the front airbag sensor pin (stopper) is easily damaged.